Monday again! I only have a few pictures to share, but hopefully in a couple days I’ll have a Trolley Run race recap to share! I’m going to share a fun little sentence per picture for you this week! Also, 1 month until my birthday! Jazzy had quite the fun time playing like a little hunter in the jungle. Wednesday night, I had a really great run, and I wrote about it here. He always keeps me entertained. Friday night I had a dinner date with this little boy. This snapchat filter is my new favorite. Saturday I had a very difficult 9 mile long run, but I survived, and celebrated with Chick-fil-a! Sunday I had a fantastic Trolley Run, and PR’d by 21 seconds! Last night, I watched the premiere of season 6 of Game of Thrones! Did you watch? What did you think? This morning was the Trolley Run! I have been looking forward to this race for quite a while, and I’ve heard great things about it! My Mom drove down for the weekend, and we had a great weekend visit and ran the race this morning. The Trolley Run is one of the largest 4 mile road races in the US, and this year was the 27th year of the race. The Trolley Run is the largest annual fund raiser for Children’s Center for the Visually Impaired. The course is unique because is a point to point course, beginning on 75th and Wornall in Waldo, and ending on the Plaza. 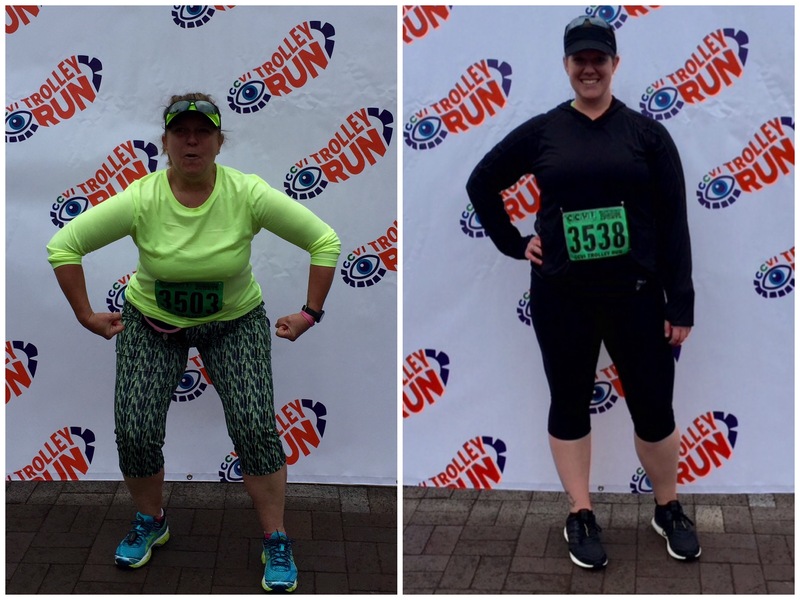 We met up with my Mom’s cousin, Kim, and my running buddy Amy, and took the bus from the Plaza to the starting line. It was a dreary and chilly morning, but luckily, the rain held off! We tried to stay warm around the start line, and listened to a beautiful Star Spangled Banner, and then the race began! Each wave had about 5 minutes between it, and there were 6 waves of runners. I think I heard someone say there were nearly 10,000 runners and walkers, which was a great turnout! My strategy for the race, which was mostly flat and fast, with some nice downhill stretches, and only a couple small uphills, was to just go out strong and steady and try to hang on! There were some fun signs, one said “Running 4 miles is easy, getting up early on Sunday morning is HARD!” So true. There was also a really cute family grilling bacon and the little kids were holding plates of bacon out for the runners! I finished the race about 3 and a half minutes faster than my previous best 4 mile race (last spring in Hays). I was really happy with my race, I felt like I left it all on the course, and now I have a shiny new PR! In looking at my mile times, I negative split the race perfectly, meaning the second half of the ride was faster than the first half. Each of my mile splits was faster than the previous! If any race photos turn out (there were a TON of runners all around!) I will edit the post and add them later this week. Mom, Kim, Amy and I all met up again after the race, and we enjoyed some of the finish festival, but it was pretty chilly, especially since we all ran hard! Another buddy from our running group also found us after the race, so of course we had to get some photos with John! All in all, it was a fantastic race!! Amy and I both PR’d, the weather held off, no rain! Later this afternoon, the sun came out and it warmed up really nicely. I will definitely do this race again in the future, it was a beautiful course, a well run race, and a really great local cause!